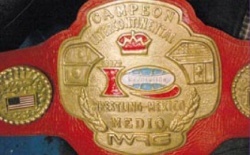 Imposible is the current champion, defeating Dr. Cerebro to win the championship on September 9, 2018 in Arena Naucalpan. title stripped on or before 2007.10.15 due to lack of defenses? ↑ final 2 in a apuesta cage match with Veneno, Hijo de Pirata Morgan, Oficial Factor, Hijo de Máscara Año 2000, Violencia Jr., Carta Brava, Carta Brava Jr., Hijo del Dr. Wagner Jr.